Win over the whole crowd with our Meatball 'Pizza' Casserole. 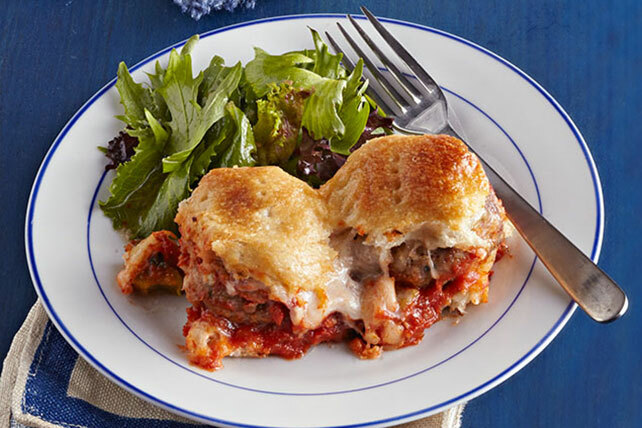 Whether they like pizza, meatballs or peppers, our Meatball 'Pizza' Casserole has it all. Prepare Easy Basic Meatballs as directed, except use 1 lb. each extra-lean ground beef and ground pork, shape the meat mixture into 24 (2-inch) meatballs, and increase the baking time to 15 min. or until meatballs are done (160ºF). Unroll 1 pizza crust; press lightly onto bottom of 13x9-inch pan sprayed with cooking spray; spread with half the pizza sauce. Top with meatballs, arranging in 4 rows of 6 meatballs each. Cover with remaining sauce; top with peppers, shredded cheese and Parmesan. Unroll remaining pizza dough; place over pizza. Pierce with large fork at 2-1/2-inch intervals to allow steam to escape. Mix 2 lb. extra-lean ground beef, 1 pkg. (6 oz.) STOVE TOP Stuffing Mix for Chicken, 1 finely chopped onion, 1 cup water and 2 eggs just until blended. Shape into 48 (1-1/2-inch) meatballs. Place on 2 rimmed baking sheets sprayed with cooking spray. Bake in 400°F oven 12 min. or until done (160°F).